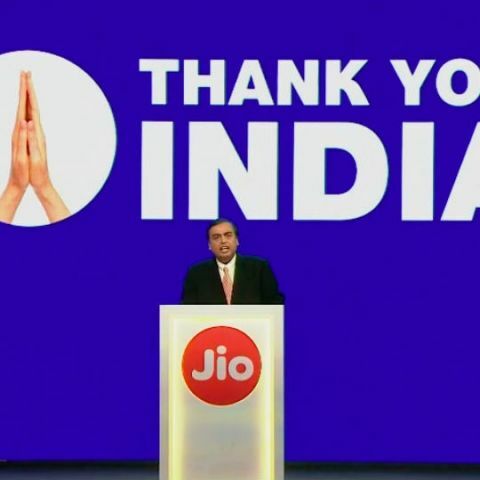 In a letter written to the employees of Jio on completion of one year of commercial operations on September 5, Ambani said: "In this past one year, we have broken several records, both in India and globally. But what gives me the biggest personal satisfaction is to have broken the myth that India is not ready to adopt advanced technology." "The way the country has embraced 4G technology and the way it is being used is already a case study for quantum technology leaps," he added. Reliance Jio is a wholly-owned subsidiary of RIL. Ambani told his employees: "The challenge was not only to launch a new technology and operationalise it in real time across the country, but to make our offering so simple, convenient and compelling that every Indian, in every city, town and village would benefit from it." According to sources, mobile data consumption in India went up from 20 crore GB per month to over 150 crore GB per month in the last one year. According to industry sources, Jio carries more than 100 crore GB data per month. "Jio is already carrying five times more data than all other telecom players put together in India," the source said. Jio commenced its wireless telecommunication services in all 22 service areas from September 5, last year. On July 21, it was announced that Jio acquired more than 100 million subscribers in barely 170 days. On an average, Jio added seven customers per second every single day. Talking about the spurt in data consumption in India, Ambani said: "This is also reflected in the gigantic spurt in data consumption and customer numbers on our network, and the way our technology, network and the entire infrastructure has held up to it." Congratulating employees and their families for their contribution, Ambani said: "Your efforts will make Digital India a reality, and its positive impact on India's economic growth is the next logical development that we are beginning to witness."